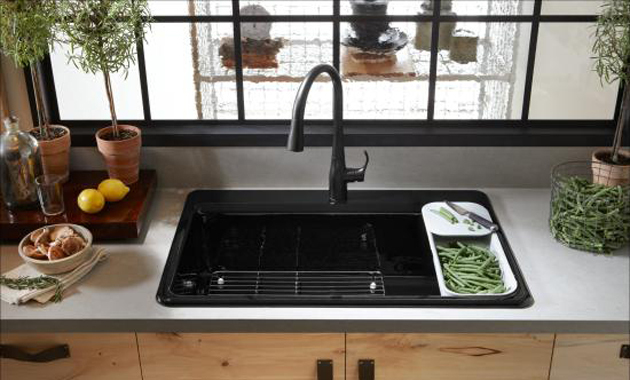 Faucet Magazine states that this Kohler Simplice faucet is one of the sleekest available on the market and will fit right in with numerous modern kitchens. We are going to review every important detail for this model. 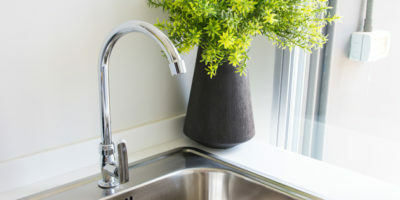 Since it doesn’t quite sparkle quite to the level of what could very easily be construed to be some ‘tackiness,’ there’s perhaps just the right amount of polish added to a faucet with a color profile and finish classified as polished chrome. It’s almost as if the chrome finish absorbs light since its reflective properties work well to incorporate whatever is being reflected into what looks like nothing more than a design element. This makes this single-hole pull-down kitchen faucet from Kohler great for just about any kitchen interior, no matter what style it is and no matter what other interior decor items it will be complemented with. It does very well as the centerpiece of the kitchen and does just as well as a complementary, albeit more permanent kitchen affixation. 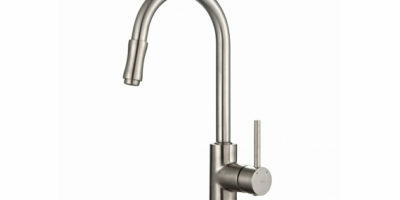 Check out more Kohler faucet model reviews here! Its styling is rather astutely classified as transitional and the base material is metal, which would never really appear to be that much different from the polished chrome finish in any case. The design goes beyond visual appeal, however, with innovation being the name of the game. This piece is designed for a great user experience, marrying elegance with functionality and exceptional ergonomics. Water consumption which is equivalent to the water flow rate (1.8 gallons per minute) is a sign of efficient performance and operation of this faucet is as easy as accessing one handle. 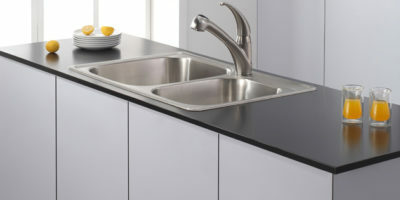 As is the case with the evolution of Kohler’s next generation of kitchen faucets, three features make this particular faucet what it is, namely DockNetik, ProMotion Technology, and MasterClean Sprayface. In action, these features respectively entail magnetic docking inside the spout to ensure a secure fit of the spray head, some braiding on the hose and a ball joint which swivels for a quiet and comfortable operation of the spray head, and mineral build-up off-setting for an easy clean. 6.1 pounds measuring 28.8 x 12.3 inches makes this quite an easy install which is deck-mounted. You can, in fact, install this faucet in a three-hole sink, and although it’s a bit of a challenge, making use of some plumber’s putty to secure the base down in place will do. As with any interior decor or structural item added into a setting such as a kitchen, there’s a certain air of novelty which surrounds the new addition. This faucet definitely does the job by way of the aesthetic side of its design, but once the novelty wears off and you’ve used it quite a few times for its intended purpose, functionality takes over visual appeal, and not in a bad way at all because you might very well be reminded of its visual appeal upon the comments of a guest who has not been around since you had the new faucet installed. The high-arch swing is one such visual design feature which translates into great functionality because while it just looks good on the eye, the manner in which the spout was affixed to the unit is such that it can swing and it can also rotate a full 360 degrees. This amounts to some comfort in its use which can go as far as having you excited about using a faucet! 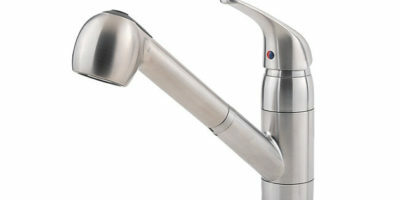 The spray head also maneuvers very smoothly, which simply means when you pull it down to the sink there aren’t any of those ominous cringe-inducing links which are otherwise synonymous with older models of kitchen faucets, especially the earliest versions of pull-down faucets themselves. So the spray head in actual fact pulls right down – right into the sink, a feature which you’ll appreciate (largely without much thought with more repeated use) for those up-close washing up or cleaning tasks, or just for filling up all sorts of different types of pots, woks, pans, etc. Your soapy, wet hands won’t be a problem either because of the sculpted and grooved buttons, which give you access to a trio of spray head functions – Stream, Sweep Spray, and Pause. The stream function is just great for filling up your pots, woks, and pans, while the sweep spray function is simply a powerful jet stream of water which is quite wide to offer quick cleaning due to its targeting of a wider surface area. 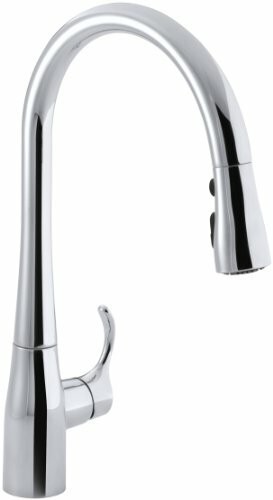 These are perhaps features which have come to be expected of any modern Kohler pull-down kitchen faucet piece, but yes they’re rounded up with the pause feature, which as you might have been able to guess allows you to stop the water flow while you adjust yourself between your kitchen tasks. Metal construction might have otherwise opened up the door for possible problems with corrosion, but that should perhaps not have even been mentioned because the chrome finish duly takes care of that concern. Just ensure no chips or chafes occur during installation.